There are many reasons that many of the front covers of my novels have roads on them. 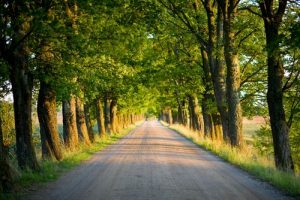 One reason is that many of the stories are set in rural areas during a time when people used dirt roads to get from place to place, often by walking. A dirt road is a metaphor for life, we travel down these twisted lanes which have hills and valleys that we must climb or descend. The road might have a blockage that we need to surmount or a bend that leaves the future deliciously out of view and calls you forward. It has forks where we must make decisions on which lane to follow. I cannot think of a better metaphor for life than a country road. SUMMER ICE, the fourth novel in the series has broken from the rule, it does not have a rural road on the cover. Instead it has a feature which is central to the plot, the ice house or root cellar. Check it out. THE NONPROFIT MURDERS, fifth in the series has an important landmark on the cover: the Guilford Smith Memorial Library where one of the fictional murders takes place. LAST ON A MATCH, sixth in the series has a cover that shows the Norwich Hospital’s Administration Building. The covers also have other little images woven into the filigree. These are clues to some of the story content that will be uncovered as the tale unfolds.